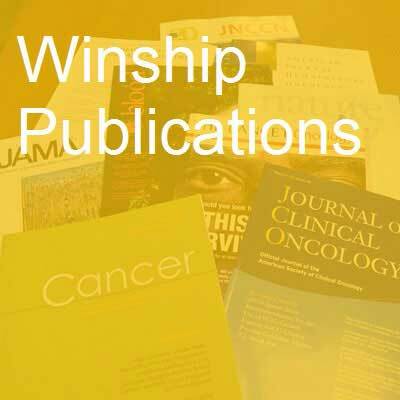 A number of first authors and senior authors from Winship Cancer Institute have published 62 studies in major medical and scientific journals in the past month. Health-Related Outcomes among the Poor: Medicaid Expansion vs. Non-Expansion States. Han X, Nguyen BT, Drope J, Jemal A. PloS one. 2015; 10(12):e0144429. PubMed PMID: 26720311. The role of inflammation in depression: from evolutionary imperative to modern treatment target. Miller AH, Raison CL. Nature reviews. Immunology. 2015; 16(1):22-34. PubMed PMID: 26711676.
International society for cellular therapy perspective on immune functional assays for mesenchymal stromal cells as potency release criterion for advanced phase clinical trials. Galipeau J, Krampera M, Barrett J, Dazzi F, Deans RJ, DeBruijn J, Dominici M, Fibbe WE, Gee AP, Gimble JM, Hematti P, Koh MB, LeBlanc K, Martin I, McNiece IK, Mendicino M, Oh S, Ortiz L, Phinney DG, Planat V, Prockop DJ, Shi Y, Stroncek DF, Viswanathan S, Weiss DJ, Sensebe L. Cytotherapy. 2015; PubMed PMID: 26724220. Elective versus Therapeutic Neck Dissection in Oral Cancer. Beitler JJ, Cassidy 3rd RJ, Jagadeesh NK. The New England journal of medicine. 2015; 373(25):2475-2477. PubMed PMID: 26672856. Interferon-alpha-induced inflammation is associated with reduced glucocorticoid negative feedback sensitivity and depression in patients with hepatitis C virus. Felger JC, Haroon E, Woolwine BJ, Raison CL, Miller AH. Physiology & behavior. 2015; PubMed PMID: 26703235. Do partial home smoking bans signal progress toward a smoke-free home? Kegler MC, HaardÃ¶rfer R, Bundy LT, Escoffery C, Berg CJ, Fernandez M, Williams R, Hovell M. Health education research. 2015; PubMed PMID: 26661723. Novel combination approaches for myeloma. Lonial S, Nooka AK. Hematology / the Education Program of the American Society of Hematology. American Society of Hematology. Education Program. 2015; 2015(1):286-93. PubMed PMID: 26637735. Non-canonical actions of mismatch repair. Crouse GF. DNA repair. 2015; PubMed PMID: 26698648. Clinicopathologic Features and Outcome of Young Adults With Stage IV Colorectal Cancer. Hawk NN, Long TE, Imam MH, Mathew BM, Kim S, Chen Z, Goodman M, Sullivan P, Brutcher E, Kauh J, Maithel SK, Adsay VN, Farris AB, Staley C,El-Rayes BF. American journal of clinical oncology. 2015; 38(6):543-549. PubMed PMID: 24662267. Evasion of anti-growth signaling: A key step in tumorigenesis and potential target for treatment and prophylaxis by natural compounds. Amin AR, Karpowicz PA, Carey TE, Arbiser J, Nahta R, Chen ZG, Dong JT, Kucuk O, Khan GN, Huang GS, Mi S, Lee HY, Reichrath J, Honoki K, Georgakilas AG, Amedei A, Amin A, Helferich B, Boosani CS, Ciriolo MR, Chen S, Mohammed SI, Azmi AS, Keith WN, Bhakta D, Halicka D, Niccolai E, Fujii H, Aquilano K, Ashraf SS, Nowsheen S, Yang X, Bilsland A, Shin DM. Seminars in cancer biology. 2015; 35S:S55-S77. PubMed PMID: 25749195; PubMed Central PMCID: PMC4561219. Perceived benefits of smoke-free homes, the process of establishing them, and enforcement challenges in Shanghai, China: a qualitative study. Berg CJ, Zheng P, Kegler MC. BMC public health. 2015; 15(1):1428. PubMed PMID: 25778143. Producing Evidence to Reduce Low-Value Care. Howard DH, Gross CP. JAMA internal medicine. 2015; 175(12):1893-1894. PubMed PMID: 26457957. Serous Neoplasms of the Pancreas: A Clinicopathologic Analysis of 193 Cases and Literature Review With New Insights on Macrocystic and Solid Variants and Critical Reappraisal of So-called "Serous Cystadenocarcinoma". Reid MD, Choi HJ, Memis B, Krasinskas AM, Jang KT, Akkas G, Maithel SK, Sarmiento JM, Kooby DA, Basturk O, Adsay V. The American journal of surgical pathology. 2015; 39(12):1597-610. PubMed PMID: 26559376. Expression of SOX10 in Salivary Gland Oncocytic Neoplasms: A Review and a Comparative Analysis with Other Immunohistochemical Markers. Schmitt AC, Cohen C, Siddiqui MT. Acta cytologica. 2015; PubMed PMID: 26619208. [In Process Citation]. Meltzer C. AJNR. American journal of neuroradiology. 2015; 36(12):2193. PubMed PMID: 26669846. Analysis of liver-directed therapies in U.S. cancer patients. Alese OB, Kim S, Chen Z, Ramalingam SS, Owonikoko TK, El-Rayes BF. Current oncology (Toronto, Ont.). 2015; 22(6):e457-61. PubMed PMID: 26715883. Distal substitutions drive divergent DNA specificity among paralogous transcription factors through subdivision of conformational space. Hudson WH, Kossmann BR, de Vera IM, Chuo SW, Weikum ER, Eick GN, Thornton JW, Ivanov IN, Kojetin DJ, Ortlund EA. Proceedings of the National Academy of Sciences of the United States of America. 2015; PubMed PMID: 26715749. Dexamethasone treatment promotes Bcl-2-dependence in multiple myeloma resulting in sensitivity to Venetoclax. Matulis SM, Gupta VA, Nooka AK, Von Hollen H, Kaufman JL, Lonial S, Boise LH. Leukemia. 2015; PubMed PMID: 26707935.
iChoose Kidney: A Clinical Decision Aid for Kidney Transplantation Versus Dialysis Treatment. Patzer RE, Basu M, Larsen CP, Pastan SO, Mohan S, Patzer M, Konomos M, McClellan WM, Lea J, Howard D, Gander J, Arriola KJ. Transplantation. 2015; PubMed PMID: 26714121. Results from an Evaluation of the Georgia Colorectal Cancer Control Program's Community Education and Outreach Events, 2013. Woodruff RC, Hermstad A, Honeycutt S, Brown M, Kegler MC. Journal of cancer education : the official journal of the American Association for Cancer Education. 2015; PubMed PMID: 26706465. SOX4 is essential for prostate tumorigenesis initiated by PTEN ablation. Bilir B, Osunkoya AO, Wiles 4th WG, Sannigrahi S, Lefebvre V, Metzger D, Spyropoulos DD, Martin WD, Moreno CS. Cancer research. 2015; PubMed PMID: 26701805. Role of race in oncogenic driver prevalence and outcomes in lung adenocarcinoma: Results from the Lung Cancer Mutation Consortium. Steuer CE, Behera M, Berry L, Kim S, Rossi M, Sica G, Owonikoko TK, Johnson BE, Kris MG, Bunn PA,Khuri FR, Garon EB, Ramalingam SS. Cancer. 2015; PubMed PMID: 26695526. Melanoma growth effects on molecular clearance from tumors and biodistribution into systemic tissues versus draining lymph nodes. Rohner NA, Thomas SN. Journal of controlled release : official journal of the Controlled Release Society. 2015; PubMed PMID: 26721446. Comprehensive evaluation of thyrotropinomas: single-center 20-year experience. Azzalin A, Appin CL, Schniederjan MJ, Constantin T, Ritchie JC, Veledar E, Oyesiku NM, Ioachimescu AG. Pituitary. 2015; PubMed PMID: 26689573. Distinct health behavior and psychosocial profiles of young adult survivors of childhood cancers: a mixed methods study. Lowe K, Escoffery C, Mertens AC, Berg CJ. Journal of cancer survivorship : research and practice. 2015; PubMed PMID: 26688575.
traseR: an R package for performing trait-associated SNP enrichment analysis in genomic intervals. Chen L, Qin Z. Bioinformatics (Oxford, England). 2015; PubMed PMID: 26685307. Interferon-alpha-induced inflammation is associated with reduced glucocorticoid negative feedback sensitivity and depression in patients with hepatitis C virus.Felger JC, Haroon E, Woolwine BJ, Raison CL, Miller AH. Physiology & behavior. 2015; PubMed PMID: 26703235. Mesenchymal stromal cells to modulate immune reconstitution early post-hematopoietic cell transplantation. Stenger EO, Krishnamurti L, Galipeau J. BMC immunology. 2015; 16(1):74. PubMed PMID: 26674007. Circulating biomarkers of gut barrier function: Correlates and non-response to calcium supplementation among colon adenoma patients. Yang B, Bostick RM, Tran HQ, Gewirtz AT, Campbell PT, Fedirko V. Cancer epidemiology, biomarkers & prevention : a publication of the American Association for Cancer Research, cosponsored by the American Society of Preventive Oncology. 2015; PubMed PMID: 26677212. Nanoscale optomechanical actuators for controlling mechanotransduction in living cells. Liu Z, Liu Y, Chang Y, Seyf HR, Henry A, Mattheyses AL, Yehl K, Zhang Y, Huang Z, Salaita K. Nature methods. 2015; PubMed PMID: 26657558. Insights into genetic susceptibility in the etiology of spontaneous preterm birth. Parets SE, Knight AK, Smith AK. The application of clinical genetics. 2015; 8:283-90. PubMed PMID: 26715857. Stimuli-responsive nanoparticles for targeting the tumor microenvironment. Du J, Lane LA, Nie S. Journal of controlled release : official journal of the Controlled Release Society. 2015; 219:205-214. PubMed PMID: 26341694. The importance of surgical margins in gastric cancer. Postlewait LM, Maithel SK. Journal of surgical oncology. 2015; PubMed PMID: 26662226. The importance of surgical margins in melanoma. Ethun CG, Delman KA. Journal of surgical oncology. 2015; PubMed PMID: 26662509. Characterization of a linked Jumonji domain of the KDM5/JARID1 family of histone H3 lysine 4 demethylases. Horton JR, Engstrom A, Zoeller EL, Liu X, Shanks JR, Zhang X, Johns MA, Vertino PM, Fu H, Cheng X. The Journal of biological chemistry. 2015; PubMed PMID: 26645689. The toll-like receptor 5 agonist entolimod suppresses hepatic metastases in a murine model of ocular melanoma via an NK cell-dependent mechanism. Yang H, Brackett CM, Morales-Tirado VM, Li Z, Zhang Q, Wilson MW, Benjamin C, Harris W,Waller EK, Gudkov AV, Burdelya LG, Grossniklaus HE. Oncotarget. 2015; PubMed PMID: 26655090. Monitoring the kinetics of B-cell recovery following rituximab may guide the management of steroid-refractory chronic GvHD. DeFilipp Z, Purcell M, Harris WA, Chandra DJ, Gleason C, Wrammert J, Sarantopoulos S, Waller EK. Bone marrow transplantation. 2015; PubMed PMID: 26642338. Plasmacytoid dendritic cells in allogeneic hematopoietic cell transplantation: benefit or burden? Auletta JJ, Devine SM, Waller EK. Bone marrow transplantation. 2015; PubMed PMID: 26642333. Titin-Based Nanoparticle Tension Sensors Map High-Magnitude Integrin Forces within Focal Adhesions. Galior K, Liu Y, Yehl K, Vivek S, Salaita K. Nano letters. 2015; PubMed PMID: 26598972. Targeting glutamine metabolism in multiple myeloma enhances BIM binding to BCL-2 eliciting synthetic lethality to venetoclax. Bajpai R, Matulis SM, Wei C, Nooka AK, Von Hollen HE, Lonial S, Boise LH, Shanmugam M. Oncogene. 2015; PubMed PMID: 26640142. Transcript RNA supports precise repair of its own DNA gene. Keskin H, Meers C, Storici F. RNA biology. 2015; :0. PubMed PMID: 26637053. Five- and 10-Year Cause-Specific Survival Rates in Carcinoma of the Minor Salivary Gland. Baddour Jr HM, Fedewa SA, Chen AY. JAMA otolaryngology-- head & neck surgery. 2015; :1-7. PubMed PMID: 26632951. Non-canonical actions of mismatch repair.Crouse GF. DNA repair. 2015; PubMed PMID: 26698648. Clinicopathologic Features and Outcome of Young Adults With Stage IV Colorectal Cancer.Hawk NN, Long TE, Imam MH, Mathew BM, Kim S, Chen Z, Goodman M, Sullivan P, Brutcher E, Kauh J, Maithel SK, Adsay VN, Farris AB, Staley C, El-Rayes BF. American journal of clinical oncology. 2015; 38(6):543-549. PubMed PMID: 24662267. Evasion of anti-growth signaling: A key step in tumorigenesis and potential target for treatment and prophylaxis by natural compounds.Amin AR, Karpowicz PA, Carey TE, Arbiser J, Nahta R, Chen ZG, Dong JT, Kucuk O, Khan GN, Huang GS, Mi S, Lee HY, Reichrath J, Honoki K, Georgakilas AG, Amedei A, Amin A, Helferich B, Boosani CS, Ciriolo MR, Chen S, Mohammed SI, Azmi AS, Keith WN, Bhakta D, Halicka D, Niccolai E, Fujii H, Aquilano K, Ashraf SS, Nowsheen S, Yang X, Bilsland A, Shin DM. Seminars in cancer biology. 2015; 35S:S55-S77. PubMed PMID: 25749195; PubMed Central PMCID: PMC4561219. Perceived benefits of smoke-free homes, the process of establishing them, and enforcement challenges in Shanghai, China: a qualitative study.Berg CJ, Zheng P, Kegler MC. BMC public health. 2015; 15(1):1428. PubMed PMID: 25778143. What's in a name? Upper extremity fracture eponyms (Part 1). Wong PK, Hanna TN, Shuaib W, Sanders SM, Khosa F. International journal of emergency medicine. 2015; 8(1):75. PubMed PMID: 26223984. What's in a name? Lower extremity fracture eponyms (Part 2). Wong PK, Hanna TN, Shuaib W, Sanders SM, Khosa F. International journal of emergency medicine. 2015; 8(1):76. PubMed PMID: 26223985; PubMed Central PMCID: PMC4512960. Stereotactic body radiation therapy versus no treatment for early stage non-small cell lung cancer in medically inoperable elderly patients: A National Cancer Data Base analysis. Nanda RH, Liu Y, Gillespie TW, Mikell JL, Ramalingam SS,Fernandez FG, Curran WJ, Lipscomb J, Higgins KA. Cancer. 2015; 121(23):4222-4230. PubMed PMID: 26348268. Transthoracic versus transhiatal resection for esophageal adenocarcinoma of the lower esophagus: A value-based comparison. Khullar OV, Jiang R, Force SD, Pickens A, Sancheti MS, Ward K, Gillespie T, Fernandez FG. Journal of surgical oncology. 2015; 112(5):517-523. PubMed PMID: 26374192. The flavonoid p-hydroxycinnamic acid exhibits anticancer effects in human pancreatic cancer MIA PaCa-2 cells inÂ vitro: Comparison with gemcitabine. Yamaguchi M, Murata T, El-Rayes BF, Shoji M. Oncology reports. 2015; 34(6):3304-3310. PubMed PMID: 26397991. A multi-institutional analysis of 429 patients undergoing major hepatectomy for colorectal cancer liver metastases: The impact of concomitant bile duct resection on survival. Postlewait LM, Squires MH, Kooby DA, Weber SM, Scoggins CR,Cardona K, Cho CS, Martin RC, Winslow ER, Maithel SK. Journal of surgical oncology. 2015; 112(5):524-528. PubMed PMID: 26496211. Suppression of death receptor 5 enhances cancer cell invasion and metastasis through activation of caspase-8/TRAF2-mediated signaling.Oh YT, Yue P, Wang D, Tong JS, Chen ZG, Khuri FR, Sun SY. Oncotarget. 2015; 6(38):41324-41338. PubMed PMID: 26510914. Serous Neoplasms of the Pancreas: A Clinicopathologic Analysis of 193 Cases and Literature Review With New Insights on Macrocystic and Solid Variants and Critical Reappraisal of So-called "Serous Cystadenocarcinoma".Reid MD, Choi HJ, Memis B, Krasinskas AM, Jang KT, Akkas G, Maithel SK, Sarmiento JM, Kooby DA, Basturk O, Adsay V. The American journal of surgical pathology. 2015; 39(12):1597-610. PubMed PMID: 26559376. Do the Science, Own the Field. Are We Doing the Science? Thompson PW, Roser SM. Journal of oral and maxillofacial surgery : official journal of the American Association of Oral and Maxillofacial Surgeons. 2015; 73(12S):S153-S154. PubMed PMID: 26608146. Expression of SOX10 in Salivary Gland Oncocytic Neoplasms: A Review and a Comparative Analysis with Other Immunohistochemical Markers.Schmitt AC, Cohen C, Siddiqui MT. Acta cytologica. 2015; PubMed PMID: 26619208. Menses resumption after cancer treatment-induced amenorrhea occurs early or not at all. Jacobson MH, Mertens AC, Spencer JB, Manatunga AK, Howards PP. Fertility and sterility. 2015; PubMed PMID: 26658130. Perfluorooctanoic acid and chronic kidney disease: Longitudinal analysis of a Mid-Ohio Valley community. Dhingra R, Lally C, Darrow LA, Klein M, Winquist A, Steenland K. Environmental research. 2015; 145:85-92. PubMed PMID: 26656498. [In Process Citation].Meltzer C. AJNR. American journal of neuroradiology. 2015; 36(12):2193. PubMed PMID: 26669846. Analysis of liver-directed therapies in U.S. cancer patients.Alese OB, Kim S, Chen Z, Ramalingam SS, Owonikoko TK, El-Rayes BF. Current oncology (Toronto, Ont.). 2015; 22(6):e457-61. PubMed PMID: 26715883. Framework for hyperspectral image processing and quantification for cancer detection during animal tumor surgery. Lu G, Wang D, Qin X, Halig L, Muller S, Zhang H, Chen A, Pogue BW, Chen ZG, Fei B. Journal of biomedical optics. 2015; 20(12):126012. PubMed PMID: 26720879.